Applications - also known as Learning Tools - create and present assessable, interactive content or tools used in courses in itslearning. A teacher (or a user with permission to add elements in a folder) can create learning objects in a folder in a course. To do this different applications can be used. itslearning comes with several tools, but you can create new and exciting tools that can be used from the add page in itslearning. 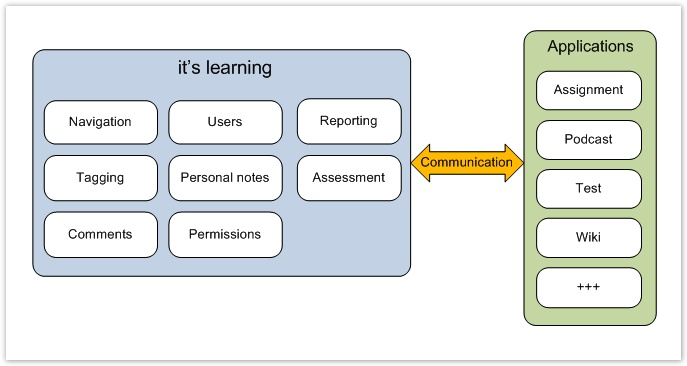 As illustrated below, itslearning's core exposes a lot of functionality to application developers via APIs, and applications are available to end users within the itslearning user interface. There is no content inside the core, but the learning content is provided by a pluggable model. The core functionality is exposed through a REST API. At itslearning, we use the same model and APis for the learning tools we have built ourselves, such as our Test tool, Hangman, Crosswords et cetera. But - our business is to provide a platform to help teachers create the best possible learning experience for their students, not to provide the content and every possible learning tool. This is where we want you as a third party to join our effort. By easily integrating your existing applications to be presented within the itslearning platform, you ensure that users can reach and use your application in a coherent way, rather than as a standalone application. Webquests - Allow teachers to build webquests, and students to take them, and teachers to grade. Mindmapping - Allow students to make mind maps. Podcast tools - Show and subscribe to a podcast, or even better be able to record directly in the browser. Learning Tools are web applications that are hosted and run in your environment. itslearning interacts with your application using a simple query string interface, and you can call our REST API to get or put additional information. Your application will run inside an iframe in the itslearning UI. The Learning Tools / Applications are not tied to a specific platform or technology; you can use any framework and programming language which supports creating web applications (.NET, Java, Perl, PHP, etc). For your convenience, a .NET wrapper assembly is available - it simplifies working with the itslearning API. The application that you develop. The content as referenced by itslearning. This is the common name that covers both Learning Resource and Learning Activity. This is a content based learning object. Examples are document and podcast. Learning resources are not given assessments or deadlines, and is more like “one-way” communication. A learning resource only uses read and modify permissions. Permissions information is passed through the query string when the Learning Tool is launched. A learning object that may have deadline and assessment. For a learning activity, some kind of interaction between teacher and learner(s) is expected. Examples of learning activities are discussions, tests and assignments. A learning activity uses the permissions participate and evaluate in addition to read and modify. Permissions information is passed through the query string when the Learning Tool is launched. A specific instance of a learning object. Because a learning object may be used in several different courses, the instance identifies a unique place where the learning object has been used.